EXTEND YOUR SYMPATHIES to those people who innocently believe that, having read articles or seen television reports about Japan, they thereby have any real knowledge of the country or its people. It’s not unusual for journalists to get it wrong—we’ve come to expect it–but it’s unfathomable how they can be so wrong about Japan so often. Even when they manage to get the facts right, there are exaggerations that would make a vaudeville comic wince and an eagerness to accentuate the negative that makes informed media consumers wonder about their real agenda. The women are holding a banner with a message that reads “Thank you China” in three languages: Romanized Japanese (arigato), Chinese (xie xie), and English. These are members of the Japanese women’s soccer team, and the photo shows their behavior just after they were eliminated from the Women’s World Cup held in China last month. A gracious act to be sure, you might be thinking, but nothing extraordinary in the world of sports. Well, gracious acts in this age are not so commonplace that we should overlook them, but this was a rare form of grace under pressure. The women are standing on a soccer pitch in front of a crowd of 40,000 Chinese in a Hangzhou stadium who had just spent the entire match booing every move the Japanese team made, cheering wildly for their opponents, and waving a large national flag when the other team scored a goal. No, the opposing team wasn’t China—it was Germany, who won the match 2-0. The Chinese behavior should come as no surprise. During soccer’s Asian Cup in China in 2004, a 60,000-strong crowd attending the final between China and Japan started booing with the Japanese national anthem. The players and Japanese fans were pelted with trash, and the fans were seated in a special section with extra security. After Japan won, angry Chinese crowds demonstrated outside the stadium. Keeping order required a police and military presence of 5,000. This year, FIFA moved up the Japan-Germany match to 17 September from the originally scheduled 18th because the latter was the 76th anniversary of the Mukden Incident (also known as the Manchuria Incident), which led to war between the countries six years later. The Chinese government asked FIFA for the change because they were concerned about their ability to provide security for the Japanese team. The incident during the Women’s World Cup ignited a fiery debate in China, as well it might with the 2008 Beijing Olympics less than a year away. Some Chinese were impressed by the Japanese women’s courage and thought their countrymen would do well to follow their example, as described in this Japanese-language report from Supootsu Hochi, published by Yomiuri. Others disagreed, claiming that it would be disgraceful for Chinese to be swayed by what they claimed was PR from Japan, a country that won’t recognize its wartime misdeeds. The report says the controversy intensified on the 18th when the online edition of the Chengdu Business Newspaper based in Szechwan Province published an account of the incident and included a photograph. In an editorial, the paper asserted that the match’s biggest losers were not the Japanese team, but the spectators. Others countered that it was perfectly natural to boo the Japanese, who deserved no consideration whatsoever. This touched off the usual e-mail and Internet free-for-all. Little of this information has appeared in English. A quick sweep of the Internet turned up only one mention in a sports blog, which got the information from the EastSouthWestNorth website. The latter were in the camp of those unhappy with the crowd’s behavior. One might find this lack of coverage curious, but perhaps we should consider the context. The IOC has to be legitimately concerned about the potential for violence against Japanese athletes and fans during next year’s Games, and might have wished to downplay the incident in the media. They’re stuck with their choice of the Chinese as hosts. As it is, China is having enough trouble trying to keep the anti-pollution promises it made when it bid for the Games. They probably will not succeed, and this recent report indicates the extent of the problem. (Note the photo.) The article does not mention Chinese excuses that the pollution is caused mostly by sand and dust storms. It does, however, quote a UN official saying that people should remember it is the first time a developing nation has hosted the Olympics. Perhaps that’s what the Chinese need to keep in mind rather than an awareness of itself as a great power. Indeed, the Women’s World Cup was originally scheduled to be held in China in 2003, but had to be moved to the U.S. because of the SARS epidemic, caused and spread by Third World levels of sanitation and public health standards. Also, the International Ice Hockey Federation cancelled the 2003 IIHF Women’s World Championship that was to be held in Beijing that year. And of course the Chinese have to be alarmed about the behavior of the soccer spectators last month because they realize how damaging a similar or more serious incident would be to the nation’s image worldwide. If people were injured—or worse—during the Olympics, it would be no consolation for anyone if the Chinese were to realize they had brought it on themselves. The country’s rulers have chosen to deflect domestic dissatisfaction by creating a sense of national unity that incorporates outrageous anti-Japanese propaganda. This policy has created a citizenry so boorish the army is required to guarantee security at an international athletic event. How else to control crowds that boo a national anthem, dump trash on innocent athletes, think courtesy and politeness is PR (damned if they do and damned if they don’t), and suffer from the delusion that Japanese deny invading China 76 years ago, before anyone in that stadium was born? Of course their reputation would be harmed. People still remember the incident that occurred during a boxing match in the 1988 Seoul Olympics. When a South Korean boxer was declared the loser in one fight, two Korean coaches jumped into the ring and pummeled one of the judges. A volunteer security staffer removed his identifying jacket and started punching the judge as well. Ringside officials threw trash and two folding chairs into the ring. Other Korean officials then turned out lights in the hall. Here’s the New York Times account of the incident. Note the excuses they make for Korean behavior in the first paragraph and last sentence. Given that paper’s attitude toward Japan, try to imagine how they would have covered the story had the venue been Tokyo instead of Seoul. Meanwhile, Japan has hosted the Olympics in exemplary fashion three times. It is beyond the realm of imagination that the incidents in Seoul and Hangzou could have happened anywhere in Japan. It is inconceivable that a Japanese crowd would boo another country’s national anthem, boo a national team throughout a sporting event, throw garbage on players and fans, and behave so badly the army is required to keep them in line. International sporting events in Japan have never been cancelled due to public health concerns. And no Japanese officials have ever thrashed a judge from another country because they were unhappy with the decision. How do the Japanese behave? We already have the example of the Olympics. Another example is the Japanese soccer diplomacy as described in this article. Twenty-three members of the Japanese Diet traveled to Dalian, China, earlier this month to play a friendly soccer match with members of the National People’s Congress. The match was organized by the Japanese, and according to the People’s Daily, the Chinese participants loved it. The Japanese hope to do it again and include South Korea the next time. And then there’s the photo above. It’s time to recognize that Japanese behavior is still the gold standard in Northeast Asia—and not only for the Olympics. Of all the countries in this part of the world, they are without question the least nationalistic and the one most actively promoting harmonious regional relations. It’s also time for the media to say it. GOT A MAIL from Oniazuma telling me about his new blog, which is mostly videos. Most of the videos in Japanese seem to have English subtitles added. You can check it out here. The one thing we can say with assurance is that Japan in the Fukuda era is about to take a large step backward as a member of the international community. Well, almost. It doesn’t have anything to do with the “Fukuda era”, however. It’s an understandable mistake considering how little Western journalists know about Japan, and their mistaken belief that individuals drive policy. What we can actually say with assurance is that it is a backward step taken because Japan is trying to come to terms with a divided legislature for the first time in its postwar history. But that’s not the real problem. Just scroll down to see what the posters are saying. Another thing we can say with assurance is that one will seldom see such a concentration of ill-informed intellectual piglets wallowing in their ignorance and thoroughly enjoying it. This poster pulled off the hat trick: (1) No knowledge of Japan, (2) No knowledge of the inadequacies (or agenda) of the average Tokyo-based journalist, and (3) No knowledge of his own incoherence. Even the people who disagree with my point of view should find this appalling. You’re of course free to write your comments here, but it seems to me those folks are desperately in need of some facts. In their face, where they can actually read it. Want to bet they can’t handle the truth? THE FIRST RECORDED MENTION in Japan of what the Japanese call chochin, or collapsible Chinese lanterns, appeared in 1085 in the Choya Gunsai, a collection of state documents and poetic works compiled by Miyoshi Tameyasu. 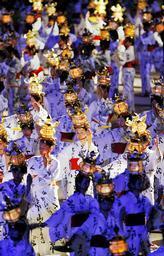 The lanterns did not come into common use by the public, however, until the Edo period, which began in 1600. 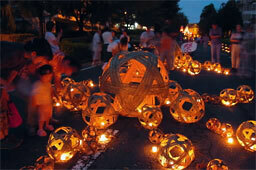 And of course they are used in Japanese festivals in a myriad of ways that are a tribute to the Japanese imagination. There’s already been an Ampontan post on the Lantern Festival in Nagasaki in February, which (like the city) has a strong Chinese influence. 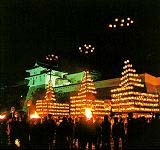 Another lantern festival, shown in the first photograph, is the Natsugoshi Toro Matsuri held every summer at the Kengun Shinto shrine in Kumamoto City. About 3,000 bamboo lanterns and chochin are placed along the main path of the shrine at night. The festival is organized by local municipal organizations in the city’s east side to promote amicable relations among the districts within the city. In addition to the static walkway display, events include a children’s procession with chochin, an adult procession with bamboo lanterns, a taiko drum performance, and dancing. One participant said that while she enjoyed lively festivals too, she found the simple and direct nature of this event appealing. If it’s a lively festival you’re looking for, the one held a week ago in Himeji, Hyogo Prefecture, is as lively as a chochin festival can be. 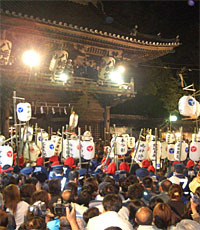 That’s the chochin fighting festival at the Usuki Hachiman shrine, an event that’s been designated an intangible cultural property of the prefecture. This is one of the largest festivals of the Harima region in the southwestern part of Hyogo, as the shrine’s parishioners come from more than 10,000 households in 24 municipal districts. 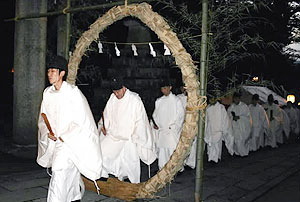 Every year on the night of October 21st, 1,000 men dressed in loincloths show up at the front of the shrine carrying three-meter long bamboo poles with a chochin attached to the end of the pole. The guys aren’t there because they want to parade—they’ve come to whack each others’ poles and knock off the chochin. Once they’ve succeeded, they keep whacking each others’ poles for the sake of whacking. Of course the chochin wind up being destroyed. If any intact lanterns happen to escape the notice of the young stick handlers, nearby onlookers thoughtfully help out by tossing the fallen lanterns back into the melee. That scene is shown in the second photograph, but if you want a better idea of what happens, make sure to watch this video. There are three stick fighting skirmishes in all, and they let it all hang out the third time around. With the whistles, chanting, and crowd noise, it resembles a sporting event more than it does a religious ceremony. That is, if it is in fact a Shinto-derived ceremony at all. The Nihonmatsu festival (third photo) features seven floats holding several hundred lanterns each, which parade through the town for three days and nights until the procession reaches the Nihonmatsu Shrine. Each of the floats represents a sheave of rice (this is the harvest season), and each carries a group of taiko drummers and flute players performing typical festival music. The origin of this festival is well known. 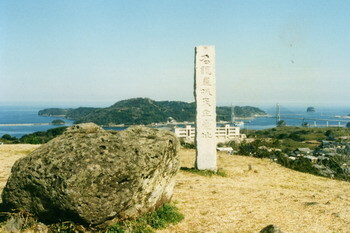 In 1643, Niwa Matsushige, the grandson of Niwa Nagashige, chief retainer to Oda Nobunaga, visited his new fief as the feudal lord of Nihonmatsu for the first time. He thought the conduct of good government required that the spirit of religious devotion be first aroused in the people, so he organized a festival at the Nihonmatsu shrine and invited everyone. Today’s festival might have turned out to be more elaborate and entertaining than what Niwa had in mind. There must be something in the troposphere over Northeast Asia this time of year, because a large lantern festival is also held in October in Jinju, South Gyeongsang Province, South Korea. Called the Flowing Lantern Festival, there’s no question about its origins, either: the Japanese invasion of the Korean Peninsula in the late 16th century. Local records indicate that General Kim Shi-min, at the head of 3,800 troops in Jinju Fortress, defeated a Japanese army of 20,000 that tried to cross the Nam River in October 1592. The general floated lanterns and torches down the river as a tactic to delay the Japanese army and to communicate with his troops and other support forces outside the castle. It is also said that soldiers inside the castle used lanterns to inform their families outside of their safety. The people of Jinju continued the tradition by floating lanterns down the river as a memorial to the Koreans who died in the battle. In 1949, they started holding a lantern play, and in 2002 this became a regional festival that now attracts two million visitors a year (fourth photo). The festival is not of the traditional Japanese sort, however; it is an extravaganza that more closely resembles a Disneyland of Lanterns in southern Korea. When people say you can find illumination in the East, they aren’t fooling! JOURNALISTS AREN’T THE ONLY ONES that have difficulty comprehending Japan and the rest of Northeast Asia. Academics can be even worse. Quebec native Daniel A. Bell is a Professor in the Department of Philosophy of Tsinghua University in Beijing. He has been studying China and Confucianism in East Asia for at least 10 years. In this article in Dissent magazine, he discusses the Chinese craze for soccer and the reasons for their passionate support of powerhouse international teams. Not only does he present more goofy ideas per column inch than I’ve seen in years, but despite crawling over, under, and all around the topic, he fails to spot the reason for this phenomenon. Yet the reason is so obvious it might as well be painted in day-glo colors, and should be immediately apparent to any scholar of East Asia. He also doesn’t seem to know very much about sports. How odd the coverage of politics has become in much of the media. It is treated as a soap opera, in which certain characters suddenly become popular or unpopular, undergo improbable personality transplants or reversals of fortune. And this is linked with the polls, just as the soaps are linked with the ratings. THE SCRIPTWRITERS of the English-language news media keep floundering as they try to devise a plot line to fit Japan’s new prime minister, Yasuo Fukuda. The putative playwrights reached new heights of creativity during Shinzo Abe’s term of office by developing a fanciful storyline of resurgent Japanese nationalism threatening to run amok in Northeast Asia like a rewound Godzilla rising from the half century-old ashes of Hiroshima and Nagasaki. Had Mr. Abe’s actual rhetoric and deeds been grafted onto a political figure in a different context–for example, most of the members of the G-7 club, not to mention Russia, China, and the other thug oligarchies masquerading as modern nations–he would have been derided as a marshmallow man. But they had to start from scratch when the ruling Liberal Democratic Party elected Yasuo Fukuda as party president, automatically making him prime minister. Their first idea was to cast Mr. Fukuda as a dove. They could even justify it, because that expression is used by a few of the more unimaginative Japanese commentators. During an off-the-record meeting with reporters in 2002, Mr. Fukuda said that Japan might have to take another look at the idea of adding nuclear weapons to its arsenal. He backed down when the reporters turned around and asked him about it in public. Mr. Fukuda strongly endorsed a bill expanding the role of the Self-Defense Forces, giving them enhanced powers during a national emergency. He also gave unqualified support to the original measure allowing the Maritime Self-Defense forces to provide support in the Indian Ocean, through refueling and other means, to the coalition forces fighting in Afghanistan. “Fukuda is more of a hardliner. He takes a harder approach than Abe, who takes the soft approach (in politics and diplomacy),” said Raizo Matsuno, a retired Diet member and longtime watcher of politics who died last year. As Matsuno predicted, Abe took a soft approach toward China when he became Prime Minister. So the media’s scriptwriters had to ditch the d-word and adjectivally downgrade Mr. Fukuda to “moderate”. But even if he was a semi-hardliner, they argued, surely the new prime minister would distance himself and the country from his predecessor’s obstinacy toward the North Koreans. Mr. Abe made his political reputation on the strength of a resolute attitude toward the North and its abduction of Japanese citizens. He was seen by many in the media as having parlayed that into the premiership. Didn’t Mr. Fukuda himself say that he was willing to talk to the North Koreans, and that Japan would prosper if it could build placid and peaceful relations with other countries? Wouldn’t he get with the modern diplomatic plan of the other five parties and talk with Kim Jong-il and his designated mouthpieces? Japan extended sanctions Tuesday against North Korea by another six months to mid-April to keep up the pressure on Pyongyang over its abductions of Japanese nationals, government officials said. The decision was made at a cabinet meeting, an official said, on the first anniversary of the North’s first ever atomic weapons test. A week after the sanctions were extended, the new Japanese Foreign Minister said they would hold secret talks with the Kim Family Regime. Japan’s Foreign Minister Masahiko Komura said on Sunday it was necessary to hold bilateral talks with North Korea secretly when needed, but declined to comment on media reports the two countries were holding informal talks. “It is necessary to hold talks below surface when needed,” Komura told reporters in an exchange shown on NHK television. Komura added it was North Korea’s responsibility to clarify the fate of the Japanese nationals abducted by the North years ago, as Japan believes that they are still alive. After all these discarded story lines, what twist will the media come up with next? Declare that Mr. Fukuda is the Teddy Roosevelt of Japan for speaking softly and carrying a big stick? For an excellent example of how the media pitches their plots, here’s an Associated Press article by Joseph Coleman just before Mr. Fukuda assumed office. JAPANESE FESTIVALS SOMETIMES GO ON THE ROAD to perform overseas, and one of the biggest matsuri road trips took place this weekend as 18 groups from Japan went to Seoul, South Korea, to participate in the two-day Japan-South Korea Exchange Festival 2007. The festival began in 2005, the official year of friendship between the two countries that commemorated the 40th anniversary of the restoration of relations, and it has become an annual event since then. The exchange festival is billed as a grass-roots event in which citizens can enjoy the local cultural traditions of both countries. Roughly 1,800 people in 62 different groups from both countries performed. There was also a recreation of the procession of envoys sent from the Joseon Kingdom to Japan about 400 years ago. Japanese media reports note that this year’s event is about 50% larger in scale than the previous two, and one of the reasons is the addition of the city of Seoul as one of the formal backers. South Korea’s capital is investing a lot of time and energy to tourism and self-promotion, and the city suspended vehicular traffic in the center of town over the weekend for parades and performances on stage. Readers who have been following this site’s festival reports will be familiar with several of the Japanese groups who performed in Seoul. The Saturday parade featured Yosakoi Soran dancers. This was an excellent choice; the dance style is energetic, popular throughout Japan, and combines both traditional and modern elements. Dancers are free to create their own arrangements as long as they use the traditional wooden clappers and incorporate part of the basic song into their musical arrangements. Also making the trip to Seoul were the Yamaga Toro dancers, who were covered here just last week, and the lantern carriers from the Kanto Festival in Akita Prefecture. The women from Yamaga perform the dance every August wearing yukata, which are summer kimono. I hope they wore something extra underneath to keep them warm on Seoul’s chilly autumn streets! 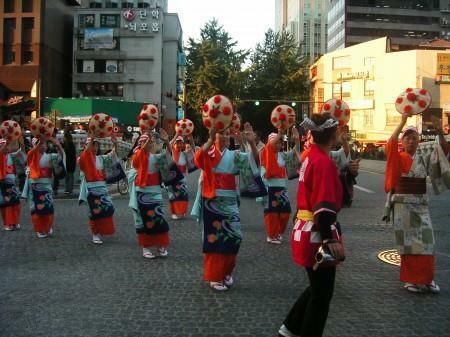 Also, there was a performance of Hanagasa Odori from Yamagata Prefecture, shown in the first photo. Not all of the performances were strictly traditional; the baton team from the PL Gakuen High School in Osaka also went. (This school is famous in Japan as a baseball powerhouse, incidentally.) The Kyoto-based group Bati-holic appeared; they present a modern take on tradition in which younger performers use the ingredients of taiko drum, flute, and dance to create something original. 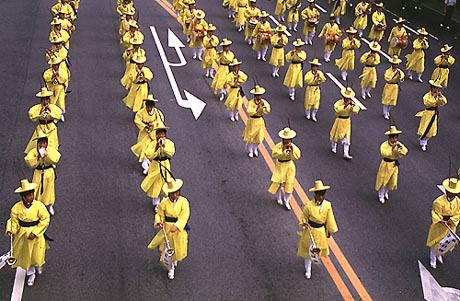 Korean cultural traditions also were on display; shown in the second photo here in the yellow costumes is a daechuida group. (Feel free to correct my Romanization.) This musical performance is an important intangible cultural property of South Korea dating from the Joseon period. Consisting of wind and percussion instruments, these groups led processions in which the king took part. There were several other performances of Korean intangible cultural properties, while many groups presented more contemporary offerings. One highlight was a performance of ganggangsullae, a traditional Korean circle dance, which was designed to get the spectators involved in the action with the performers. When I wrote this, there weren’t many reports on the web in English. Here’s one from the Korea Times, and this seems to have been the text of a KBS broadcast. The Chosun Ilbo had a few reports in Japanese earlier in the week, but I couldn’t find anything on their English site. There were plenty of reports in the Japanese press; both Kyodo and the national Mainichi Shimbun had stories. (Japanese-language links are as evanescent as the dew, which is why I don’t provide them.) Many local and regional newspapers ran articles on the event, particularly the newspapers from those areas that are the home of the festivals represented. Here is the Japanese website for the event. Unfortunately for English-only readers, it is just in Japanese and Korean. Click the circular photos at the lower right to see more details on the Korean and Japanese groups that appeared. I couldn’t find a comparable Korean site; if anyone knows of one, let me know and I’ll link to it. This event sounds like a capital idea and the perfect vehicle for combining several contemporary currents: the growing grassroots interaction between Japan and Korea, Seoul’s efforts at municipal self-promotion, the showcasing of cultural traditions, and the updating and modernization of traditions while paying homage to the past. It will be a great opportunity for foreigners in Seoul to learn more about Korea. Yes it was, and it was also a great opportunity for foreigners and Koreans in Seoul to learn more about Japan! Need I mention that if the organizers need any English language help for next year’s event, I’m the guy to ask? If anything is right down my alley, this is it! YESTERDAY’S POST described how a foreign university professor tried to use a conversation between himself and a local cab driver as a way to expose Japanese insularity and their lack of knowledge of the outside world, but instead unwittingly revealed the academic’s own lack of understanding of Japanese culture. The article was written by William Lise, a technical translator who often does patent translations and also has worked as a court interpreter. Mr. Lise has spent all but a handful of the past 40 years living and working in Japan. At the time of the article’s publication, Mr. Lise was an officer of JAT and a frequent contributor to the Bulletin. I got in contact with him by e-mail, and he gave me permission to use the story. Since I can’t find the text version, however, I’ll have to retell it and hope I do justice to the original. I didn’t know what to say at first. This was a college town, so dealing with the affected attitudes of my fares was an occupational hazard, but she didn’t seem to be that kind of person. It was more likely that she had never spent a lot of time studying a foreign language. People who do study a foreign language with the objective of fluency quickly discover it’s impossible to learn another tongue without learning a lot about that country’s culture. But instead of giving her that kind of answer, I just let it go and said, yes, I was studying the culture too. After reading this article in the Japan Times, however, I realized it was possible for apparently intelligent people to become fluent in a foreign language without understanding much about that country’s culture. Roger Pulvers writes about the belief among some Japanese that their language is the most difficult in the world. He relates a conversation with a Tokyo cab driver in the mid-80s about this subject. Well, for the 15-minute ride home I strove to persuade my driver that this, in fact, did not seem to be the case. I pointed out the fiendish difficulties of the languages that I had studied in my life, Russian and, particularly, Polish being much more complicated in grammar and pronunciation, at least for a native speaker of English, than Japanese. I finished my discourse as we rounded the corner by my house. Having listened attentively to my passionate, if pedantic, foray into the esoterica of comparative linguistics, the driver stopped the cab by my front gate, turned his head around to me and smiled broadly. 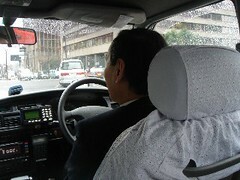 . . .Why did my taxi driver at Seijo Gakuenmae persist in perpetrating the myth of difficulty? Here was my first thought after reading this passage: This guy is writing fiction. As a translator, I know more than a few foreigners fluent in Japanese, but I’m not sure any of them can spout such phrases as the Japanese equivalent of “the nominative plural of male animate nouns” off the top of their head. No doubt there are a few somewhere who can, and perhaps Pulvers is deeply immersed in linguistics studies from a Japanese perspective, but I have my reservations. People who study foreign languages also wind up learning a fair amount of grammatical terms, but most don’t bother with the specialized vocabulary for grammatical forms that don’t exist in the language they’re studying. Here was my second thought: What is this man trying to prove? It’s not unusual in the United States to run into cab drivers with a master’s degree and an ambivalent attitude toward the workaday world, but I’ve yet to run into any in Japan. (Guys like that in Japan tend to open up coffee shops or bars, play jazz on the shop’s sound system, and refer to famous musicians by their first name only.) Does he really think he’s going to have a meaningful conversation about comparative linguistics with a cab driver? Does he think he’s going to change the driver’s mind? Is he one of those academics who just isn’t aware of what people usually talk about when they’re passing time and exchanging pleasantries? Here was my third thought: Pulvers may have a superb command of the Japanese language, but he still doesn’t understand the basics of Japanese culture. That’s because the driver wasn’t interested in talking about the Japanese language. He was just trying to strike up a casual conversation with a foreigner. In the mid-80s, even in Tokyo, his foreign customer was probably the highlight of his day. Foreigners new to Japan often complain about how Japanese like to start conversations by bringing up what they consider to be trivial subjects, such as the foreigner’s Japanese ability, dexterity with chopsticks, or the weather. The tragedy is that they’re being given a basic lesson in one of the primary differences of Japanese culture and they fail to recognize it. Yes, starting off with a comment about the weather is a cliché in the West for a trivial conversation. In Japan, however, that’s considered an excellent way for two strangers to break the ice. Listen to the start of a radio or TV broadcast, and one of the first things an announcer will talk about is that day’s weather, even if he knows most of his listeners are several hundred kilometers away. I have even translated training manuals for sales personnel that recommend the salesperson create a friendly relationship with the prospective customer by talking about the weather. It’s puzzling: one reason for visiting a foreign country is to find out how those people live. Once there, the best way to find out is to pay attention to what happens every day between people at the most basic levels of society. But some folks seem not to have noticed that one of the key points in Japanese social interaction, whether it’s in a classroom or a bar, is the effort put into getting everyone on the same page by seeking the least common denominator. Talking about the weather or chopsticks may be trivial, but that’s the easiest way to create and maintain a pleasant relationship for the next ten minutes (or the next ten years) without ruffling any feathers. Getting involved in a discussion about politics or any other subject that generates strong opinions could easily become unpleasant for both parties and destroy the potential for a harmonious encounter. When people in the West say that one of the basic differences of Japanese society is the emphasis on cultural harmony, they mean it! So why not believe it? This is such a basic component of Japanese behavior that the failure to recognize it suggests to me that some people are just too self-absorbed to learn about their surroundings. I’d be willing to bet the cab driver couldn’t have given a flying fig about the difficulty of the Japanese language. He was more likely impressed with his passenger’s speaking ability and figured the best way to have a pleasant 15-minute chat was by complimenting the guy indirectly on his language ability. But no—Pulvers couldn’t just casually agree and direct the conversation elsewhere. He had to give the cab driver a lecture about Polish grammar. Maybe some people do need to take a course in culture when they’re studying a language. Of course, there’s one other possibility. After listening to some pretentious foreigner butcher his language with an incomprehensible explanation of the nominative plural of male animate nouns in a language he’ll never speak in a country he’ll never visit, the driver decided he was justified in believing that Japanese was the most difficult language in the world after all. HIDDEN AMONG THE MOUNTAINS of Kumamoto Prefecture, the city of Yamaga has a presence that makes one think there might be something to feng shui after all. While standing on the main street downtown–which slopes downward, makes a sharp 90-degree turn, and slants further downhill–I could sense the energy pouring down from the mountainsides above. Several hours later that night, energy in a different form came flowing down that same street and made that same turn—hundreds of women dressed in summer yukata and the traditional geta footwear, each wearing a lighted lantern on her head, dancing to a very slow and stately song many centuries old. And that’s just the first night of the Yamaga Toro Matsuri of the Omiya Shinto Shrine. On the second night, the ranks of the ad hoc dance troupe swell to a full 1,000 and they offer a performance that would have made Busby Berkeley envious. A performance, I might add, that’s not staged on a Hollywood back lot, filmed, and viewed only by film aficionados and those with a taste for camp. This live performance is offered free of charge every year, and has been for centuries. 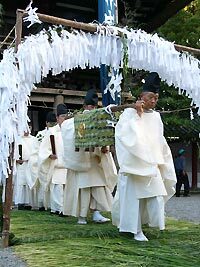 Held on the 15th and 16th of August, the festival is said to originate from a visit paid to the area by the Emperor Keiko. The Emperor arrived on a foggy night, so the local men lined the side of the road holding lighted pine torches to illuminate the mountain road. The retinue of his imperial highness was met in the town by women who had formed a circle around a tower holding lanterns on their heads. That’s how the story goes, but Keiko is listed as the 12th emperor, with a reign extending from 71 (perhaps) to 130. The emperors from that period might well be only emperors of legend, which would make the story of the festival’s origin a legend, too. Yet seldom do legends give birth to such stunning events in tangible form. Activities begin shortly after noon, when lanterns made in the shape of the temple and the local castle are placed as decorations at 25 locations throughout the city. These lanterns, or toro, are made out of wooden frames and Japanese paper. They will be presented to the shrine as offerings at midnight on the last day of the festival. At 6:00 p.m., with dusk approaching, women dressed in pale pink yukata with lighted lanterns on their head dance to a traditional song, Yoheho-bushi, at the shrine as an offering. At the same time, a different group perform the same dance in the downtown area. 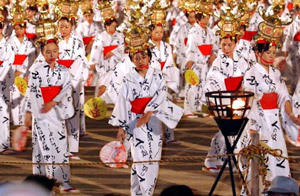 The next night, the number of dancers swells to 1,000, including women from outside the city, to recreate the welcoming ceremony for the Emperor Keiko. The men also recreate the torchlight procession. The lanterns worn by the women are handmade by local artisans with paper and glue that comes from Yame in Fukuoka Prefecture (a town which is also known for its tea). The artisans require ten years of training to master the craft, which is said to be unchanged since the Muromachi Era about 500 years ago. The festival is so spectacular, yet so sublime, it attracts 300,000 visitors every year to a municipality with 58,000 residents. I’ve seen this festival myself, or at least the first day of it. The 16th fell on a Monday the year I went, so I had to be satisfied with going to the first half on Sunday the 15th. But even just that one day was memorable–I watched entranced as the women slowly danced down the hill as they have for centuries on the town’s main street, followed by the fireworks. Yamaga is in a hot springs area, and the city fathers had the foresight to pipe spa water into pools on the street corners downtown for use as footbaths. After spending most of the day walking around town, the footbaths and their natural spring water were quite welcome. It was very pleasant sitting with my feet in the warm water and taking in the town’s visitors as they enjoyed the more commonplace parts of the festival–eating, drinking, and milling about. I dried off my feet, got back in my shoes and socks, and returned to the corner for an unexpected sight. The women were filing down the street once more, not dancing this time—hundreds of them, still with the lighted lanterns on their heads, still in pink yukata and geta, flowing in harmony with the energy spilling down from the mountains, turning at the corner and disappearing down the hill. What a lucky man you are, I thought. I thanked divine providence, or whatever is responsible for me being here, to allow me to see such beauty and participate in such a transcendent experience. To see for yourself, click either of the two photos at this site to view a movie. Even Busby Berekely would be impressed. WHILE SOME PREFER TO INSIST against evidence to the contrary that the Japanese and Koreans get along like dogs and cats (or dogs and monkeys, as the Japanese say), they are unheeded by many in both countries who are quietly working to forge closer ties on many different levels. The exhibit is being jointly conducted with the Jinju National Museum of South Korea. Located in the southern part of the Korean Peninsula, Jinju was the site of heavy fighting between Japanese and Korean forces. The Japanese museum is exhibiting 166 items related to Toyotomi’s military campaigns. The Japanese contributions include a letter from the Emperor asking Toyotomi to call off his invasion, and a letter from Ming Dynasty China regarding a Sino-Japanese alliance. (Toyotomi was seeking closer ties with China, which was providing some support to the Koreans. He was angered by the condescending tone of the letter, and that ended that.) The Jinju museum’s contribution to the exhibit includes such items as swords and an early artillery piece used by the Japanese forces. The event will run until November 25, and costs just 300 yen (US$2.55). (It’s free for people of high school age and younger.) For those who think Japanese neglect to examine their history, the story was right there in the middle the first page of the local news section of my newspaper, with a photograph. For those who think exhibits such as these are held only in major cities, the population of Chinzei-cho is about 9,000. The nearest big city is at least an hour away. There is a great deal of interaction between Japanese and Koreans—even about touchy historical issues—that passes under the radar of the Western and Korean media. It might be because they are unaware of it, or it might be because they choose to ignore it. But it exists nonetheless, despite those who, for reasons of their own, prefer a different narrative when depicting bilateral ties. NOW HERE’S A SERENDIPITOUS FIND—while searching for something else on the site of an Internet merchant, I discovered a recently-published book that looks intriguing. It’s called Bankrupting the Enemy: The U.S. Financial Siege of Japan Before Pearl Harbor. According to the publisher’s blurb, the main points are as follows. American government experts thought the war in China would bankrupt Japan, but didn’t realize that Japan had a supply of dollars hidden in New York. When the Americans found out about the money, Japan tried to repatriate it. President Roosevelt moved to block them by using the 1917 Trading with the Enemy Act to freeze the assets and forbid the sale of Japanese gold to the U.S. Treasury (the only open gold market at the time). Some Washington bureaucrats “thwarted” the plan, however. (The blurb does not say how.) Dean Acheson, the man Roosevelt selected to implement this plan, managed to prevent Japan from getting the money. The author examines an OSS-State Department study of conditions in pre-war Japan that found the measure created economic hardships for Japan. Those hardships contributed to the country’s resolve to maintain the aggressive course that led to Pearl Harbor. Apparently, no one in the U.S. government had bothered to analyze the policy’s impact on the Japanese economy. The publisher’s promotional copy is not well written and might lead a reader to think the OSS study was conducted before the war. As a poster on this History Channel discussion board notes, however, the OSS did not exist at the time. The book’s author, Edward S. Miller, responded to the note by stating that the OSS study was conducted in 1943 and was a retrospective look at Japanese economic conditions in the 1930s. He used this to extrapolate financial conditions in Japan had it not launched its attacks in 1941. Mr. Miller is now retired, but has served as the chief financial officer at two companies, so he seems well qualified to understand financial operations of this sort. He is also the author of a book called War Plan Orange, which analyzes American war plans devised over the early part of the 20th century to deal with a potential Japan-U.S conflict. That book won five awards. That in turn suggests Roosevelt’s idea might have backfired by exacerbating rather than defusing Japan’s aggression. In other words, the attack on Pearl Harbor might not have been the result of a deliberate Roosevelt strategy, but a Roosevelt miscalculation. But as Sherlock Holmes said, “It is a capital mistake to theorize before one has data,” and I just discovered the book’s existence this week. Here’s the page on the publisher’s website. FOR A LOOK AT HYPOCRISY IN ACTION, try the current editorial in The Washington Post on a House resolution censuring Turkey for the genocide of up to one million Armenians during the First World War. The bill’s chief sponsor, Adam Schiff, represents a district full of people with Armenian heritage. House Speaker Nancy Pelosi has important Armenian financial backers, and she intends to bring the resolution to a floor vote. House Democrats pushing for a declaration on the subject have petty and parochial interests….How many House members can be expected to carefully weigh Mr. Schiff’s one-sided “findings” about long-ago events in Anatolia? Why is the Post upset? The problem is that any congressional action will be taken in deadly earnest by Turkey’s powerful nationalist politicians and therefore by its government, which is already struggling to resist a tidal wave of anti-Americanism in the country. Turkey’s prime minister, Recep Tayyip Erdogan, called President Bush on Friday to warn against the resolution. Turkish politicians are predicting that responses to passage by the House could include denial of U.S. access to Turkey’s Incirlik air base, a key staging point for military operations in Iraq and Afghanistan. The Post admits the Turks may not have been angels. It’s true that Turkey’s military and political class has been inexcusably slow to come to terms with that history, and virulent nationalism — not Islamism — may be the country’s most dangerous political force. Turkish writers and intellectuals are pushing for a change in attitude, and formal and informal talks between Turks and Armenians are making slow progress. A resolution by Congress would probably torpedo rather than help such efforts. The Armenian genocide resolution cannot be called frivolous. In fact, its passage would be dangerous and grossly irresponsible. For people with an interest in Japan and whose political memory stretches beyond the current news cycle, this brings several questions to mind. Why is the Washington Post concerned about the “petty and parochial interests” of the people pushing this bill when it was unconcerned about the interests of Mike Honda and others backing the comfort woman resolution? Why does it refer to Mr. Schiff’s “one-sided ‘findings’” (note the dismissive quotation marks) when it swallowed whole the disputed findings of historians in the comfort woman dispute? Why are they concerned about the 200,000 comfort women (a figure likely inflated) who lived, but unconcerned about an estimated one million Armenians who died? Why are they willing to give credit to Turkish writers and intellectuals pushing for a change in attitude, but unwilling to give credit to Japanese writers and intellectuals with a similar position? Why are they glossing over Turkish nationalism after savagely condemning a much milder form of the same in Japan? The reason is obvious. Many Turks are more than ready to register their anger at the House resolution by taking concrete action that damages U.S. interests in the region. The conclusions that should be drawn in Tokyo are also obvious. Turkey is not prepared to lie down passively when the Congressional cupcake crusaders cast foreigners as villains in a self-penned morality play presenting themselves as the avatars of righteousness. They fight back. When that happens, the American political establishment wakes up. Instead of wasting everyone’s time and money with full-page ads that no one reads, Japan should take specific steps to stand up to the United States and let the House poseurs know that copping an attitude has consequences. As chance would have it, the opportunity has presented itself in negotiations to extend the special agreement for American military bases in the country, which is due to expire in March. The Americans are demanding that the Japanese significantly increase their contribution to pay for utilities, while patting themselves on the back for keeping China and North Korea at bay. The only way for a country to gain respect for its sovereignty is to assert it. By its recent dealings with North Korea, the United States has shown that it doesn’t consider Japan to be even a junior partner in the alliance. Moreover, the American attitude will likely grow worse if a Democratic administration takes power 15 months from now. The Americans want the Japanese to pay more of the water bill? The Japanese should think about the wisdom in the old song, You Don’t Miss Your Water (Till the Well Runs Dry), and apply it to their relationship with the U.S. This might be enough to garner Japan the attention of eight former secretaries of state and The Washington Post (the political establishment’s unofficial house organ). If it doesn’t, and the Americans choose to snarl back, it will be an eloquent expression of how much importance Americans attach to Japan and the bilateral relationship.